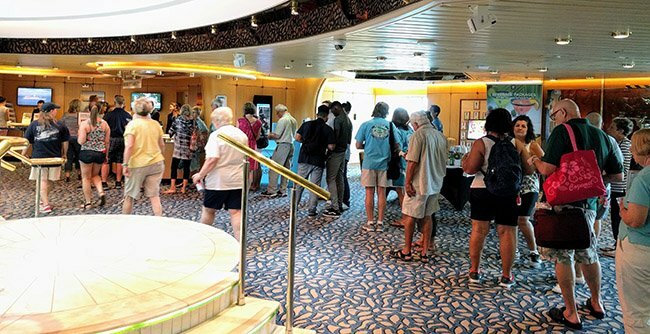 With every embarkation day there is a feeling of "vacation is finally here", despite the fact it isn't really a full day after checking in, muster, etc. 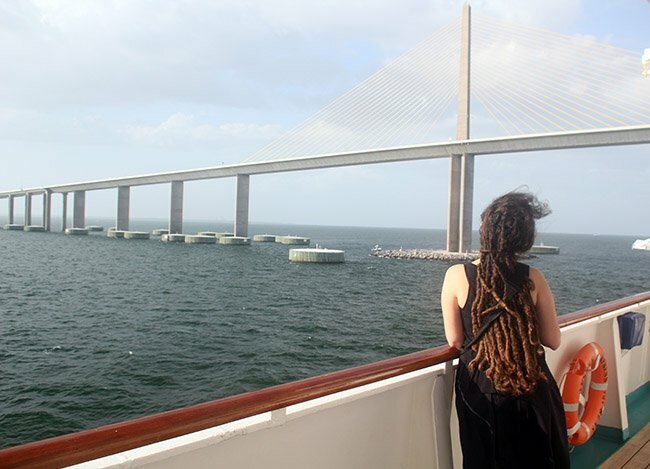 Today however was all the sweeter after a rather eventful arrival in Tampa, which you can read about over on CruiseHabit.com. Adding to the excitement was the fact hat to us, Empress is a new ship, Tampa is a new port, and Cuba is a new destination. Ahead of the cruise we stayed at the the Tampa Marriott Waterside Hotel & Marina, which is about a ten minute walk from the port. The hotel was lovely, providing excellent views, and friendly service. 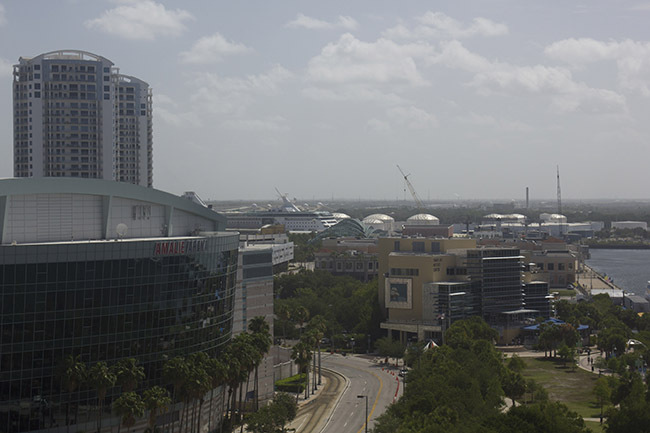 For the price (a bit over $215/night) it was more than we needed, as we just worked on our laptops and slept, but if you'd like to enjoy downtown Tampa, Ybor City, and be close to the port, it's a great option (and the pool area is very nice). Our room faced the channel and port area, so when my alarm went off this morning (a very unwelcome alarm I should add, as we went out with CruiseHabitRic last night) my first thought was to get a glimpse of the ship from our balcony. Actually, the first thought was, "I drank too much last night, where's the Tylenol" - but wondering about the view was a close second. Once opening the curtains I wasn't disappointed, I was able to see the Empress of the Seas teasing me, and waiting for our arrival, which unfortunately would need to wait, as Larissa had some work to finish up and we had to pack up. Once ready we opted to take Lyft to the port. We could have walked if we didn't have so many bags and it wasn't so hot, but I'm nobody's hero. I should mentioned that Michael Poole (who is live blogging at OasisOfTheSeas.live this week) said I could use Downtowner, an electric vehicle service in Tampa and other areas, and go to the port for free. Again though, with all that luggage I didn't want to add complication, so a $5 Lyft ride was an easy decision. We arrived at about 11:45am. I'd heard great things about the port in Tampa, and it is small, which makes things convenient. Security was quick, the facilities were clean - all seemed well. Once through security we had to complete the health questionnaire (where they ask about recent illness). What was different this time is that because we're sailing to Cuba, this is when we were asked to complete the affidavit about our travel plans. This added a bit of time, but really wasn't a big deal. As you're required to retain a copy of your travel documentation to Cuba they give you a copy of these once you fill it out (though I just opted to take pictures with my phone). Up to this point, smooth sailing. We went into the "Gold" Crown & Anchor line (for the last time, we become platinum after this cruise) which is fine. So far my Royal Caribbean check-ins had all been quite fast. This time things were a bit busier, likely because of our late arrival. The way the employees managed the queues however was a bit flawed, as the second someone walked into the Platinum+ line they'd take people from there - which meant we were waiting more than a few minutes before our line got a shot. Finally a port employee saw this logic was causing a major backup and changed things up, but we ultimately waited in that line for 30 minutes, which I felt was a bit long. Once up to the counter the process was quick and smooth, and we were also handed our Cuban visas. We were onboard Empress within 10 minutes of getting up to the counter. I enjoy small ships, and the feel of Empress embodies much of what I miss from ships of the past. Lounges than span the beam of the ship, great views of the ocean, and tiny bathrooms. Okay, that last part I just live with. I found Empress to be in great shape, with most fittings and furniture appearing brand new. The style isn't outdated, but seeing a ship of this size and configuration in great condition was almost like being in a time machine. We headed to the Windjammer for lunch, and it's obviously quite small, but we didn't have much trouble finding a seat - though you may have to queue up just a bit for food as they don't have the "island" configuration of most newer ships. After lunch I needed coffee, and attached to Boleros is Café Royal, which is the onboard coffee bar serving up Café Bustelo, a brand of Cuban coffee. The coffee was nice and strong and Larissa bonded with the barista, who is also Brazilian - so that's where I can find Larissa much of the cruise, I'm sure. Oh, and with the purchase of coffee you can get pastelitos, which are Cuban pastries. Whether they enforce the "you must buy coffee" requirement remains to be seen, but with the drink package, it doesn't make much of a difference to me. Muster drill went as expected except for the crew and officers, who were very high energy - asking guests to chant the station number and other important into. I'm not usually into this type of thing, but I do see it as effective safety - I certainly remember that I'm station 6. 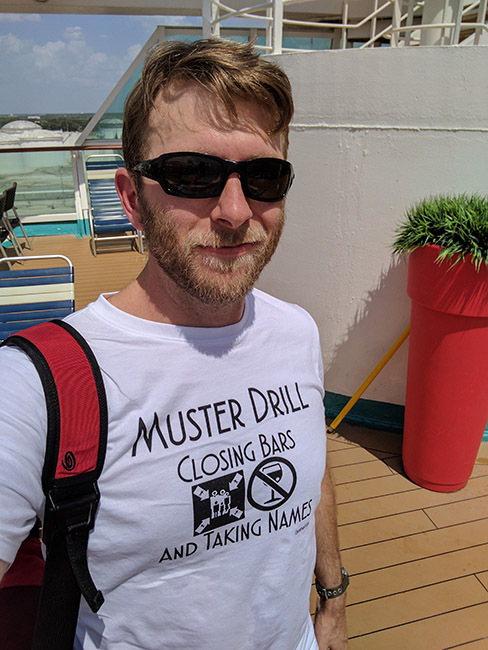 I of course wore my muster drill shirt, which you can buy here (yes, I have no shame). We walked a bit and noticed that the Casino is split level (and non-smoking!) which is interesting. It was a bit warm in there and I know they had some A/C issues last week. We also passed through the Schooner Bar, which is quite large on this ship. One thing I wanted to mention is that it seems that the shore excursions desk gets very busy on this ship. It may be related to some changes with available tours in Havana, but the lesson is to go make changes early if you need to. If you need help remembering the value of this, check out the line I waited in. Note however that the staff was really working hard and efficiently - there was just a lot of demand. 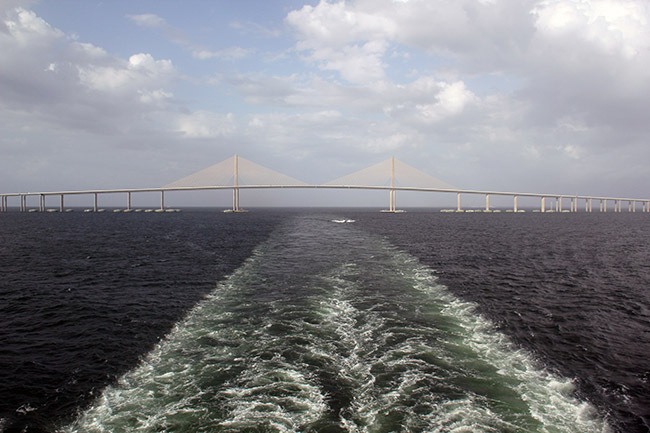 We were excited to sail through the bay and under the Sunshine Skyway bridge, and in fact, before we knew we were taking this cruise, we'd booked a Brilliance sailing just to experience sailing out of Tampa. While I knew it was a long sail-away I didn't realize how long. I started a Periscope broadcast about 10 minutes after pulling away from the pier, and had some nice chats, but then signed off to do another broadcast once we got to the bridge - as my friend Brandon informed me it was going to be about two hours before we got to the bridge. Once we sailed near the bridge it was no let-down. The bridge is quite long and there is something about a cruise ship going under a bridge that is just neat - something I'm not sure I can explain if you've not done it. We then headed back into Boleros, where we'd already spent some time. You can actually go outside from Boleros, which is all the way aft. There is a great patio area from which you can watch the ships wake. It's a great spot, though smoking seems to be permitted in this area. It was open enough though that the smoke wasn't a bother, so we relaxed with a beer. Tonight we opted to head to the main dining room (our deck is called "Starlight". I love this room. I'll get some photos when it's not full of guests, but there are massive windows at multiple angles, an elevated platform with a grand piano, and it feels very open. I'm excited to share this in the coming days. We had a truffle risotto and a few appetizers as it was Italian night. The food was good - perhaps a tiny bit salty, but I was satisfied. I planned on checking out the Windjammer afterward to see what the options were but got lazy. I will check it out for late night snacks though. 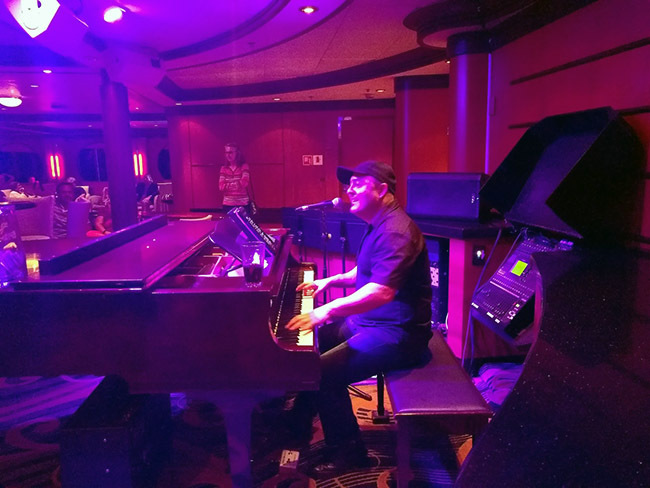 After dinner we headed to the Schooner Bar to see Billy, a pianist and vocalist who sings a lot of Billy Joel. These things combined with my name being Billy made for very confusing head turns for me every time someone shouted "Billy!". He interacts with the crowd a lot, and I have a hunch he knows how to work any audience. Our friend Ron was on the past several days in addition to this sailing, and seemed to enjoy Billy quite a bit. As I write this, I'm listening to Billy continue as I sip my scotch, Ardbeg, which they keep at the Schooner Bar for me. 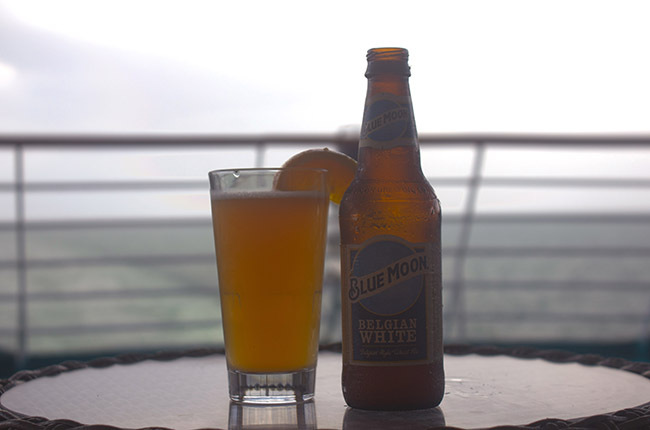 We don't arrive in Key West until around noon, which means, as a late riser, I may actually see our arrival. Brunch, which is usually only served on sea days, is reportedly being served tomorrow in the main dining room on account of our oddly-timed arrival. We haven't any plans, but usually when we sail into Key West we take Old Town Trolley Tours around, as it's an easy and economical way to get around to any of the town's hot spots. One tip here, is each time I've done this on Royal Caribbean or Celebrity, the price of this ticket through the shore excursions desk is actually a couple dollars cheaper than buying tickets directly. That in mind, there are always coupons for purchasing directly. I guess the real tip is that only fools pay retail...for Old Town Trolley. While we like the town, there is also a small chance we'll just stay on board, as Larissa and I have been longing for a lazy day - it's been a busy few weeks. We'll see what happens.